No one likes to be blindsided by changes, particularly those in companies in close contact with you and which can affect you directly. Therefore, Dun & Bradstreet’s Business Intelligence Reports keep you up-to-date on every aspect of developments in these companies, including changes in solvency, bounced checks, arrears, restricted bank accounts, lawsuits, etc., and sends ongoing real-time updates directly to your inbox. 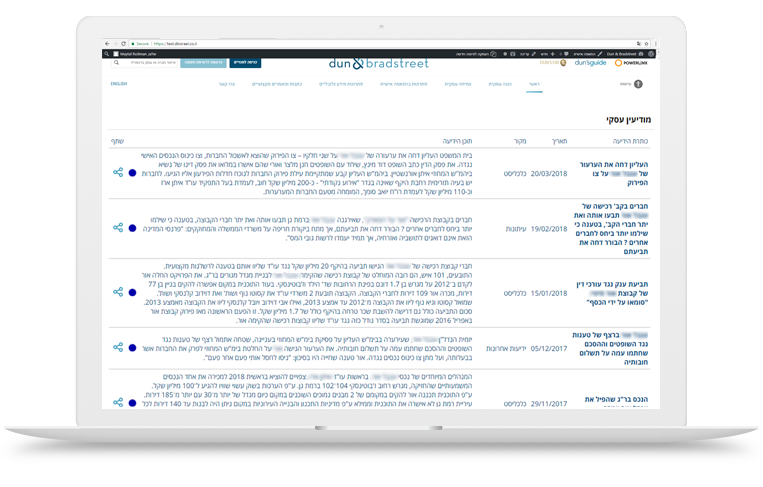 Dun & Bradstreet’s Business Intelligence Reports help you avoid risks both before and during any business engagements. It also helps you identify business opportunities in advance. Interested in Business Intelligence ?